* Nova 5 recess kit "RK" may be ordered separately here. Nova 4 & Nova 5 hand dryers shall be manufactured by or for Nova Hand Dryers to include a one-piece cover constructed of .20” thick cast iron (Nova 4® ) finished in white acid-resistant porcelain enamel or .09” thick die cast aluminum finished in brushed chrome plating or epoxy coating (Nova 5® ). 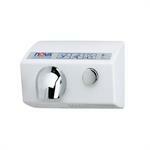 Dryers shall be fitted with 360 degree revolving die cast aluminum nozzles finished in bright chrome plating. Surface-mounted covers shall be fastened by two flat- head, recessed tamper-resistant bolts to a heavy-gauge steel wall plate, which in turn shall be fastened to the wall or a wall box by four concealed mounting bolts. (For recessed dryers only: A steel wall box shall be furnished into which a complete base assembly shall be mounted). 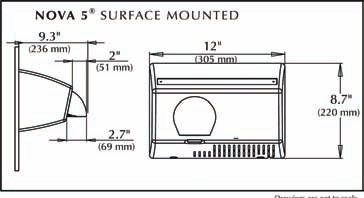 The dryer shall be equipped with 15 air intake slots (Nova 4® ) or 30 air intake slots (Nova 5® ). The fan shall be protected by an aluminum die cast grating fixed into the blower housing. The entire mechanism shall be internally grounded throughout. The motor shall be brushless, 1/10 H.P., 3200 RPM, thermally protected. The fan shall be a large single inlet centrifugal type contained in an aluminum die cast housing. It shall deliver 148 cubic feet per minute of air volume (4700 LFM) and shall be mounted directly on the motor shaft. The heating element of nichrome wire shall be mounted on the air intake. 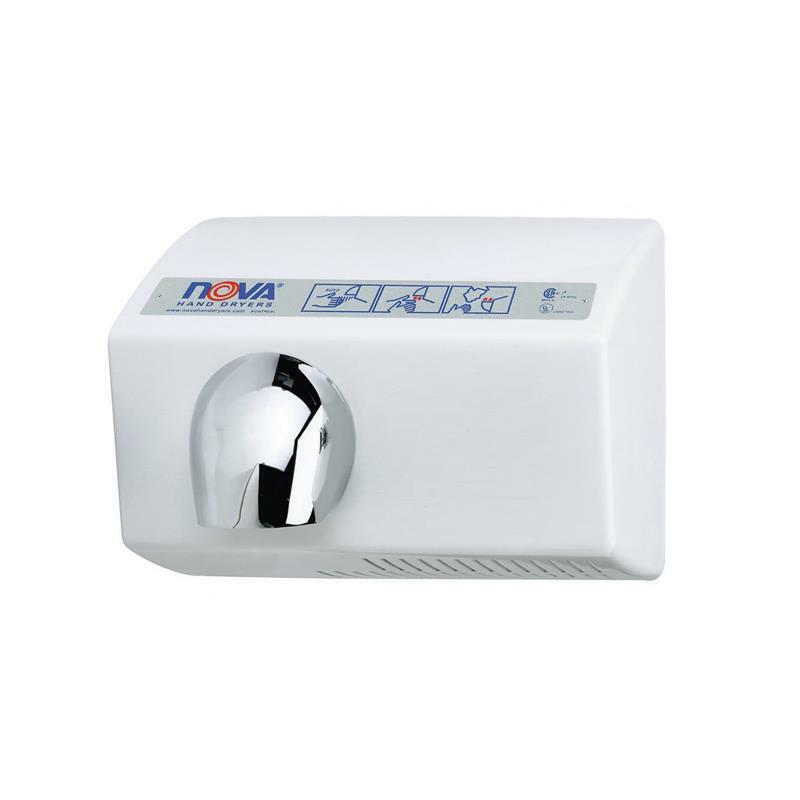 It shall be protected by an automatic resetting circuit breaker (25 AMP) which shall open whenever the air flow is cut off and shall close when the flow of air is resumed. The element shall produce an air temperature of 142 F at a 72 F ambient room temperature. The dryer shall be equipped with an infrared sensor which will allow the dryer to start automatically when hands are placed underneath the air nozzle, and to stop automatically when the hands are removed. 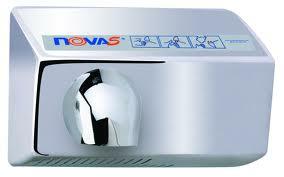 For push button dryers (Nova 5® only), timer shall be micro-chip based and micro-switch activated. It shall be adjustable to allow for the required time cycle setting. 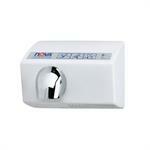 Nova® Hand Dryers shall be listed under reexamination service of Underwriters Laboratories, Inc.